This Edison short works on about the same level as the Lumiere film “A Sprinkler Sprinkled,” and delivers the same kind of prankish voyeuristic opportunity to its audience. 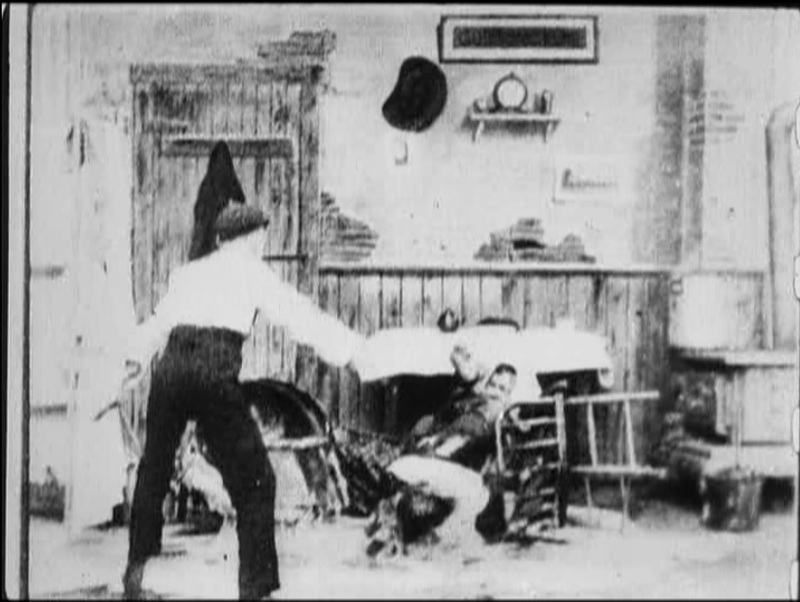 Humor in early cinema was largely limited to very basic pratfalls and slapstick, as it would take greater length and complexity to set up other kinds of jokes. We see a set representing the inside of a working class home or apartment. A man dozes on a chair to the right of the stage, while a woman (possibly a man in drag) works at a laundry tub to the right. When the woman goes to answer the door, a child runs out and ties on end of a string to his father’s chair, and the other to the piece of laundry his mother has left in the tub. When she returns, she begins cranking the wringer and inadvertently pulls over the chair, which itself pulls over the tub when it falls, resulting in both parents falling into a puddle of sudsy water. The boy runs out and laughs riotously at the sight. I’m not certain if this film was shot at the Black Maria, but if so it is by far the most elaborate set we’ve seen there. By this time Edison cameras were small enough to be portable, so they may have been shooting at another location. I spoke of these kind of movies as “voyeuristic” above, and like all movies they give an audience a chance to fantasize by watching about participating in acts they do not commit themselves. In this case, the audience gets to enjoy the child’s humor at causing an accident, but avoids having to suffer or witness the consequences of this act. Other movies of this type, including “The Sprinkler Sprinkled,” also allow the audience to watch as the perpetrator is punished – without being punished themselves, thus allowing them to enjoy both the act of revolt and its suppression in safety. This movie denies us that part of the experience, but leaves it to our imagination what befalls the boy when his parents get off the floor. One final note is that most modern children have probably never even seen a “mangle” or wringer, and would probably need to have the joke explained to them, although children at the time surely knew exactly what was going on. This short from Edison contains action and suspense, and even the beginnings of a plot as the bravery and selflessness of rescue teams is put at the forefront. While the melodramatic adulation of fire fighters may seem quaintly nineteenth century to us today, it is worth remembering that 9/11 raised similar emotions in audiences quite recently. We see the front of a building, with four windows visible and ladders propped against it. Smoke billows from all of the window, and two teams of firemen work from the highest ones, helping people in civilian clothing out the windows and onto the ladders, where they descend below the frame line. At one point, a fire fighter tosses a doll out the window to one of his fellows on the ladder. He then tosses it casually to the ground. After two men and a woman have been rescued, the fire fighters themselves go in and out of the windows, seemingly uncertain, for a few seconds. 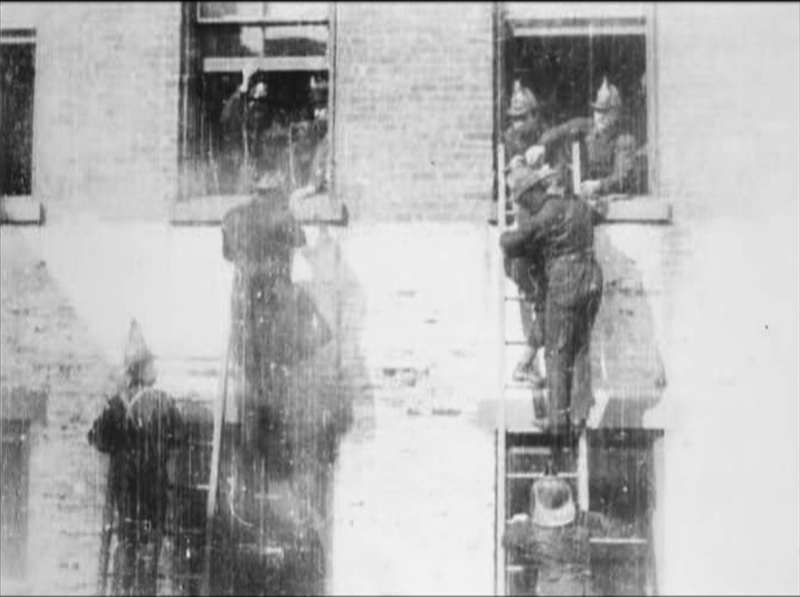 The original catalog entry by Edison emphasizes “the efficiency of modern life-saving methods and apparatus now in use by the fire departments.” All it looks like is a few men on ladders, but presumably this emphasis on modern efficiency would have carried over to the live narration an exhibitor would have used to accompany this film. I assume that this was a staged event or a training exercise, and not a real fire, although it might have been presented to audiences as authentic, and there’s nothing that actually proves it fake. The doll being tossed from the window is the one odd bit, and I wonder if it was intended to help simulate a child-rescue, but the performers didn’t understand this and just tossed it quickly aside to get to the “real” rescuing. An early narrative short from Edison Studios, this film seems to have comedic intentions. 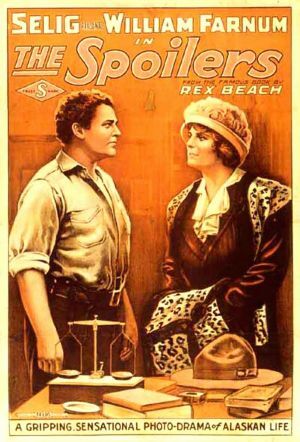 While it’s too short to give a developed plot or characters, it shows that expectations of some kind of story were beginning to develop quite early in cinema. 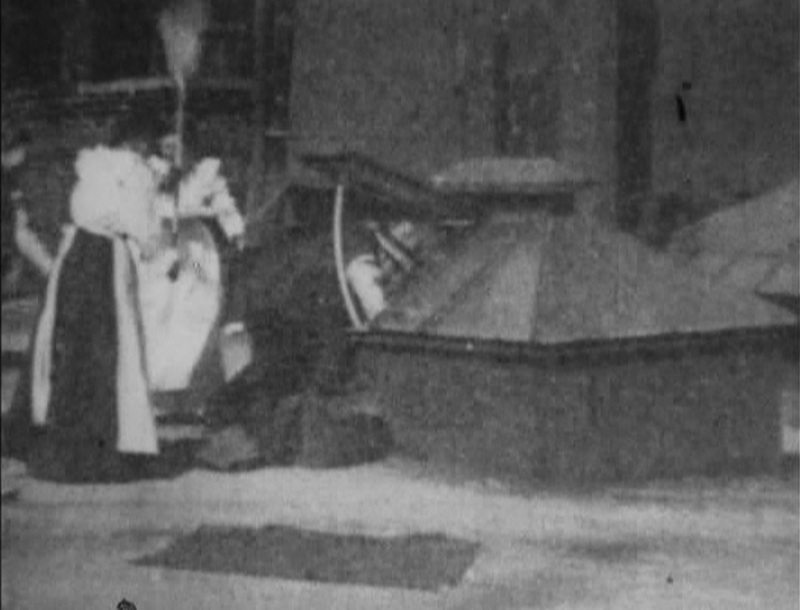 We see a man hunched over a skylight, removing coats and other objects. Two women walk up from behind him and one begins swatting his bottom with a broom. He falls to his knees, and then some men rush up and engage him in fisticuffs. At first, he acquits himself well, but his opponents overwhelm him and the woman continues hitting him with the broom while he is held in place. I’d call this movie an early example of slapstick, since it relies on simulated violence for its humor, although it is not reliant on difficult or dangerous stuntwork to make this point. The audience presumably is meant to get pleasure from seeing the burglar get his comeuppance and there is a “vulgar” element in that he is hit on his behind by a woman at first – hardly noticeable today, but far from “proper” in the nineteenth century. It’s worth noting that Alice Guy was also making movies about burglars on rooftops the same year, although I don’t know for certain which came first. Our roundup of headlines from 100 years ago shows a mix of tragedy and triumph, with natural disasters, political unrest, and important movies being released in a month that marks the end of the second full year of fighting in Europe. Here are some of the things newspapers were talking about at the time. Bulgaria declares war on Romania on Sept 1, going on to take Dobruja. Battle of Flers–Courcelette in France begins September 15 with a British advance. 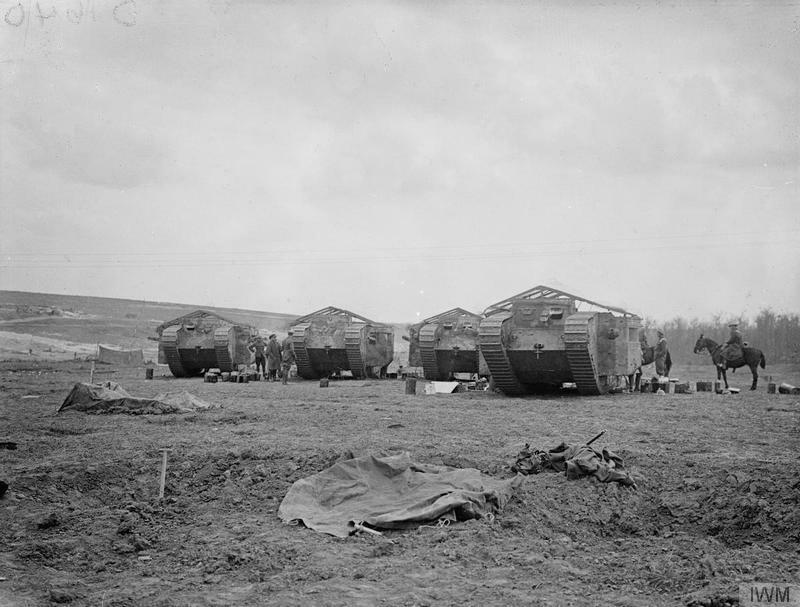 The battle is significant for the first use of the tank in warfare; also for the debut of the Canadian and New Zealand Divisions in the Battle of the Somme. British pilot Leefe Robinson becomes the first to shoot down a German Zeppelin over Britain. 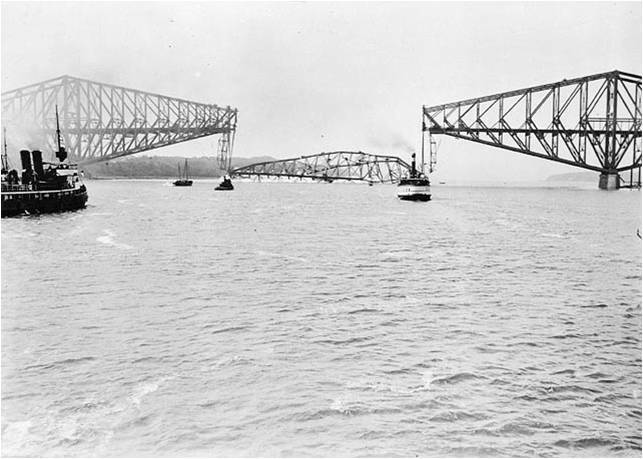 A mechanical failure causes the central span of the Quebec Bridge, a cantilever-type structure, to crash into the Saint Lawrence River for the second time on September 11, killing 13 workers. Mary, a circus elephant, is hanged September 13 in the town of Erwin, Tennessee for killing her handler, Walter “Red” Eldridge. Iyasu V of Ethiopia is deposed in a palace coup September 27, in favour of his aunt Zewditu. 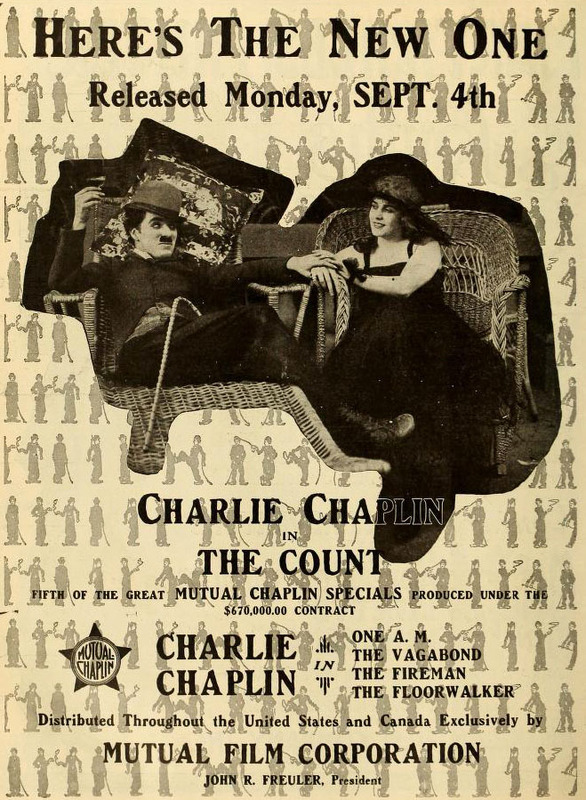 Charlie Chaplin’s short “The Count” released September 4. Release of D. W. Griffith‘s film Intolerance: Love’s Struggle Through the Ages in the United States, September 5. Douglas Kennedy (actor, in “Adventures of Don Juan” and “The Amazing Transparent Man”), Sept 14; Margaret Lockwood (actress, in “Night Train to Munich” and “The Lady Vanishes”), Sept 15; Rossano Brazzi (actor, in “South Pacific” and “Omen III”), Sept 18; Peter Finch (actor, in “Network” and “The Miniver Story“), Sept 28. Sydney Ayres, 37, American stage & screen actor and director, The Sting of Conscience, The Avenger, As in a Dream, multiple sclerosis. Arthur Hoops, 45, American stage & screen actor, The Secret of Eve, Bridges Burned, Extravagance, The Eternal Question, The Scarlet Woman, heart attack. Camille D’Arcy, 37, American actress, The Prince Chap, Captain Jinks of the Horse Marines, A Daughter of the City, The White Sister, The Pacifist, infection from bathing. For a moment, I’d like to step out of the world of century-old history, and talk about modern exhibition of historical films. Last year, I attended the 51st annual Cinecon Film Festival in Hollywood and I saw some great films, but I also saw what looked to me like a film festival in trouble. I wrote some supportive things, but I wasn’t sure I’d go back again this year. I’m glad I did. This year the program may not have been quite as exciting, but the festival itself was more cohesive, better-attended, and better organized. Sometimes it takes a tragedy to jolt people out of their complacency, and that may be what happened here. About three months before the festival, Bob Birchard, the long-time President of the Cinecon nonprofit, died. I think what happened at that point was that a lot of people who had been Letting George Do It (or Bob) suddenly realized that if they didn’t step up to the plate, the festival wasn’t going to happen. And they did. 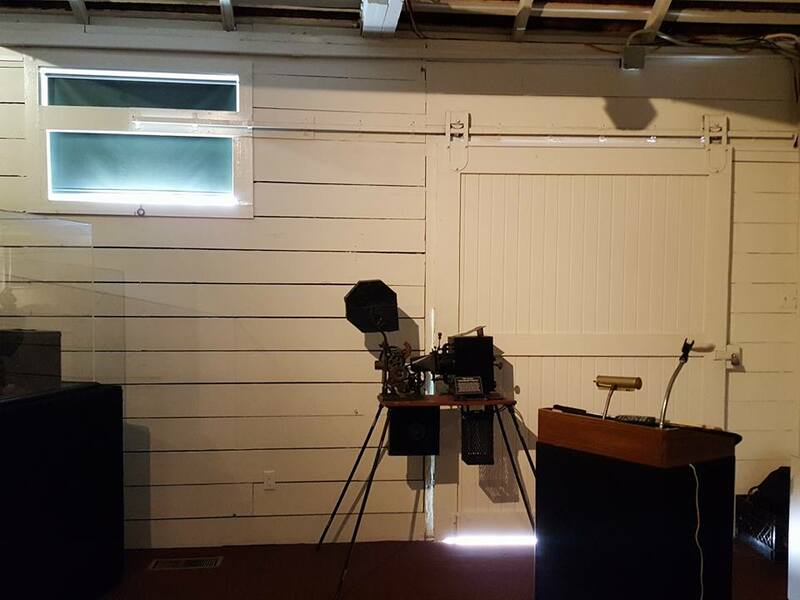 The Hollywood Heritage Museum offered funds and threw their oft-closed doors open for festival attendees. Cinecon got the schedule of films out early for the first time in years. They reached out for donations, discounts from local restaurants and businesses, and early registrations. They prepared a new logo and a really exciting set of between-films “bumpers.” In general, they improved their branding and went from being a stodgy, old-fashioned film festival, to something more like a Con, in the sense of Gen Con or Comic-Con (not in the slang sense of ripping people off). The result was much higher attendance and visibility, and a much less “in-club” feeling – a more inclusive event that felt more comfortable to be at. I’ve already reviewed the two Century Films I was able to see at Cinecon, and I don’t want to turn this into a column reviewing movies that don’t fit the theme of this blog. I did get to see a number of exciting films, though, including “Battle of the Century” (1927) and “King of Jazz” (1930), both of which I’ve been reading about as they made the festival circuit over the last year. The “King of Jazz” restoration was partly inspired by Bob Birchard’s request some years earlier, and “Battle of the Century” was restored thanks to past-president Jon Mirsalis. Speaking of, both he and Frederick Hodges were on hand to provide music for the silent films, as well as Scott Lasky, who was new to me but also acquitted himself well. Jon Mirsalis actually brought a high-tech synthesizer for his accompaniment, which allowed him to simulate many different instruments for those films, while Hodges and Lasky went with the traditional solo piano. Other standout films for me included Paul Leni’s “The Last Warning,” “Who Done It?” with Abbott and Costello, and the hilariously bad “Jungle Mystery” serial that ran interspersed through the first four days of movies. I hope I’ll see some of you at Cinecon 53! This is another movie I saw at the Cinecon Film Festival in Hollywood. They did us the special favor of showing both this and the 1930 version with Gary Cooper. I took notes to keep them straight, but Coop’s voice was still in my head whenever I read William Farnum’s subtitles. I’m writing again from Cinecon, and this is one of the movies that was presented here. As with last year, this means that I’ve only had a single viewing to work from (I usually watch films at least twice before writing a review) and have no access to the film to fact-check myself, I have to work from memory. This version of Robin Hood was made by the Éclair studios from their newly-established studio in Fort Lee, New Jersey, a major film center during the 1910’s. It foregrounds the romance between Robin and Marian, making other aspects of the story more incidental. Robin is played by Robert Frazer, who is in a love-triangle with Marian (Barbara Tennant) and Guy de Gisbourne (Lamar Johnstone), which is complicated by the fact that Marian’s father wants her to wed Guy, and conspires with the bad guys to bring this about. Robin is captured early in the film, but helped to escape by his Merry Men. The sheriff then issues a warrant for his arrest, but Robin’s men use tree branches as camouflage and ambush the sheriff’s party, tying them to trees. They perform various acts to alleviate the oppression of the people, including a raid on a nobleman’s house in which their escape is aided by Marian and her female servants flirting with the sentries. There is a great swordplay scene in which the sheriff’s men attack Robin and some of his companions in a tavern. They make their escape up the chimney. Friar Tuck saves the disguised King from molestation by the Sheriff and brings him back to Robin’s camp, where he beats Robin in duel, betraying his identity. Robin and his men pledge themselves to the King, and the King witnesses his marriage to Marian (after they rescue her once again) in a ceremony in the forest. Marian’s father protests, but must submit to the King’s will. It was pretty clear that this was a major production for Éclair in 1912, in terms of production value and budget it is well ahead of most work of the time. For one thing, it is three reels long, which should make it about 45 minutes, although only about a half hour exists in the print I saw. Even so, that’s longer than most 1912 movies already. The costumes and multiple camera set-ups speak to the prestige of the movie as well. The fight scene in the tavern involved at least three camera angles, which is pretty rare for the period. We also get several close-ups, some scenes shot at 45-degree angles, color tinting on the print, and special effects like the fades from close-ups of the villains to animals they resemble in character. The camera is often at closer than full-length, giving us a chance to see the faces of the main characters clearly. The swordfights, while hardly Errol Flynn and Basil Rathbone, and handled well and there is a good deal of action in the picture. I was less impressed by the acting. The Éclair studio was very new, and had to hire actors from the stage or with little acting experience at this time, and it shows. There are a lot of overly broad gestures and jerky movements, especially among the supporting players. Others have noticed the oddly oversized hats that the male characters wear, though this didn’t bother me as much. This movie is not available on the Internet at this time. Another short Edison film documenting the Spanish-American War, this movie comes from a location most Americans would never see. As with “Shooting Captured Insurgents” and “Troop Ships for the Philippines,” this shows the embryonic film industry’s eagerness to participate in nationalist celebration as the country entered conflict. We see a dock from a slight angle, as if the camera is on shore and slightly off-set. Uniformed soldiers are marching down the dock towards us. Some of them carry flags. 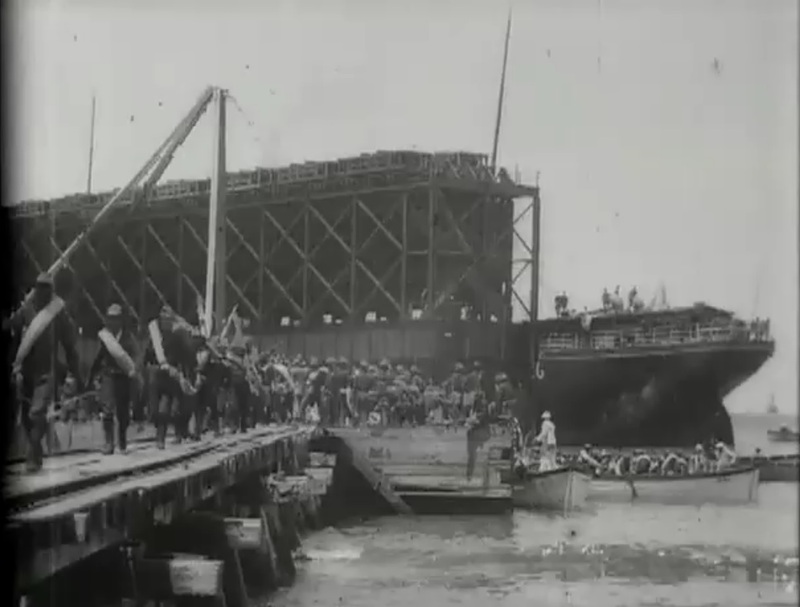 In the background, we see a large rowboat approaching the dock, full of more soldiers, and behind that a ship is moored to a larger dock, apparently intended for unloading cargo. As the men walk towards us, an officer comes into view, walking away from the camera down the dock, apparently reviewing the new arrivals. There are a lot of movies of parades of various kinds from this period, especially from the USA. Apparently filmmakers, looking for subjects that moved rather than standing still, found them an easy sell for early exhibitors, and cheap to produce: So long as the parade was already scheduled, all you had to do was show up with a camera. To us today, watching people march past a camera gets boring pretty fast, but in cases like this it clearly connected the audience to news-worthy events that otherwise they could only read about, or see depicted in still images. It’s not like we don’t see images of parades on our screens today, we simply associate them with a broader multi-media experience, at least including narration. And, the audiences of 1898 would likely have had a live narrator, speaking to them about the historic significance of the event and the names of battalions and leaders, etc. The Edison catalog entry for this film claims that this image shows the first US troops to land on Cuban soil during the war, which may be mere ballyhoo, but would have piqued people’s interest at the time. Note that the quality of the copy on the “Invention of the Movies” DVD is much lower than that of the Library of Congress online version linked above, however, this version plays at a higher frame rate, making the movement appear more natural.